I am an employee and Accor Advantage plus member of the Accor Hotels, and for the grand amount I paid for my one week stay, I was extremely disappointed. On Fridays, Saturday and Sunday's from 3pm onwards (until approx. 1pm), the whole reception/lobby area turns into a nigh club scene which makes it almost impossible to have any conversation with reception. The hotel staff lack knowledge of the area and are no help with public transport or shuttles. They are not willing to go the extra mile. (Wasn't even asked how my stay was when I checked out) The rooms are extremely noisy (especially on weekends) and almost impossible to sleep some nights. The amenities in the room are bare minimal with only a tv, no kettle, tea or minibar. Certainly won't be returning! A good choice if staying in Hollywood. Location is within walking distance to all attractions. Also close to a Metro station make it easy to travel around. Deco of the hotel is special and although it may not be to everyone's taste but it shall definitely be a memorable stay. Take time to visit the roof top bar it is special and one could see the Hollywood sign from there. Great place & excellent service one major criticism - the lifts are terrible, extremely slow & especially the dedicated room lift. You have to wait for ages & it slowly bumps from side to side to go up or down. Both lifts need a major overhaul. At the very least speeding up & faster response time. Very nice bathroom & shower. Rooftop patio/bar is great on a beautiful day. But more of a party place & crash pad for a group (an extra bed came with the room.) Check-in/-out counter is difficult to access when the bar area is busy, much less with luggage. 'City view' room had one strangely tiny window and so much empty wallspace, one was covered with a mirror. I stayed on the second floor, directly above the bar which is open until 2am, which meant I was awake with dj music & crowd noise until 2am. The air vent blows directly on your face while in bed. Check-out took ages because of the crowd trying to get to the rooftop and people checking in. Move the hotel desk away from the bar! I'd come back to the rooftop bar, but don't think i'd stay here again. Mama Shelter Los Angeles is an absolute gem ! The hotel has a relaxed and modern atmosphere, the staff are extremely nice and helpful, our room was spacious, trendy (great decoration) and fully equipped with all necessary "modcons". The rooftop bar and restaurant area is just fabulous (incredible view over LA, delicious food, very reasonable prices for LA ...) and altho' we didn't have the opportunity to test the restaurant and bar inside the building, there seemed to be an overall atmosphere of good will and well-being from the clients when we walked through the area. One little tip: the hotel offers self-parking at around 25$ (with a 5 minute walk back to the hotel after parkiing) or valet parking at 39$... we were so exhausted upon arrival that we took the valet parking, only to discover the next morning that just around the corner there is a Public Parking at 10$ per day ... But we were so well taken care of at the Mama Shelter LA that we really didn't mind ... ! The location is very good. It is in walking distance to Hollywood walk of fame and other attractions. ,restaurants Staff very helpfull. 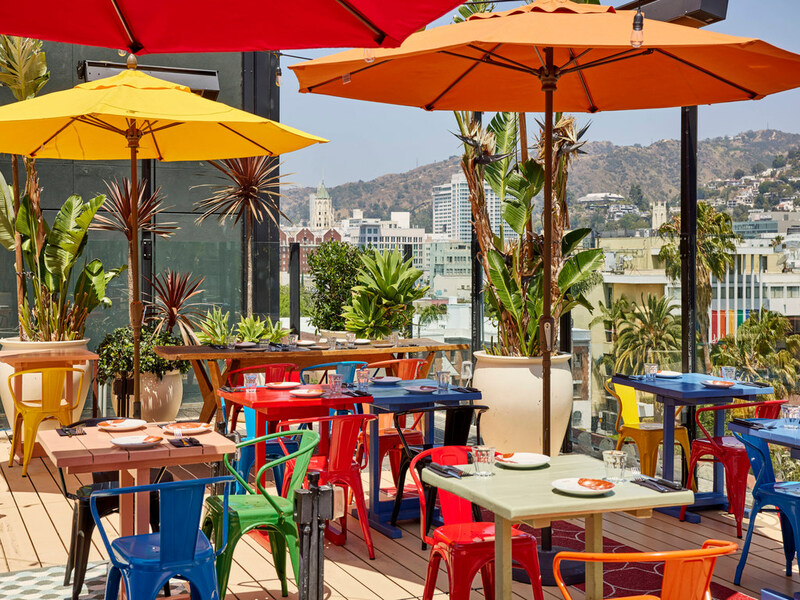 The rooftop bar has amazing view including the Hollywood sign, its a popular place for locals and other visitors too. The restaurant has a variety of meals my favorite was the Grilled Pork chop $28 and Braised Short Rib $24 USA downside the cost of wine the cheapest chardonnay $48 USA !! Thank you to the following staff at reception Azalia Daniel Rhsen and in the restaurant Calvin. I only gave the room average due to the size, the hotel is very clean the bed very comfy. Great stay and great location. Ideal location for the Hollywood Boulevard and Hollywood Bowl. Staff were friendly and very helpful. Rooftop bar gave a decent view of the Hollywood sign and was quite relaxing as the sun went down. Would book there again. Our stay at Mama Shelter LA was very enjoyable. The hotel had a very 'funky' atmosphere and the staff made us feel very welcome regardless of the time of day. It was a nice touch having a 'security guard' welcoming us back to the hotel every time we arrived back at the hotel. The restaurant staff were so happy and nothing was too much trouble. The only problem was the lift/elevator which was out of action from day 2 of our stay. My daughter had a bad knee and found it difficult to get up and down the 4 flights of stairs every time we wanted to go out. Heaven knows how anyone who was wheelchair bound would manage! Having said that, I would recommend this hotel to anyone who wanted to stay in the centre of Hollywood.